Rage Fab is proud of our heritage as a third-generation shop. We have served our community and the public for 50 years. We started in a small town in northeast Arkansas. As a result of our down-home, small-town way of doing business, we go the extra mile to treat people the way we would want to be treated. After all, in a small town business, if you don't have repeat customers, you won't have any customers. Our company shares that same attitude and philosophy with the world. We love the challenge of presenting the best looking, strongest and most functional parts and accessories for today's growing ATV and UTV market. American raw materials are used as much as we possibly can. One of our goals is to make products which our customers will be as eager to show off as we are. Look, fit and finish are held to very high standards in our shop. Rage Fab strives to build the strongest, best engineered and the most attractive accessories on the market. They're also made to be as easy to install as possible. We have brought our love for Fabricating race car chassis and engines to the Sports Utility world and found it to be a great fit for us. We love our work. Our parts will last as long as the UTVs they are fitted to. 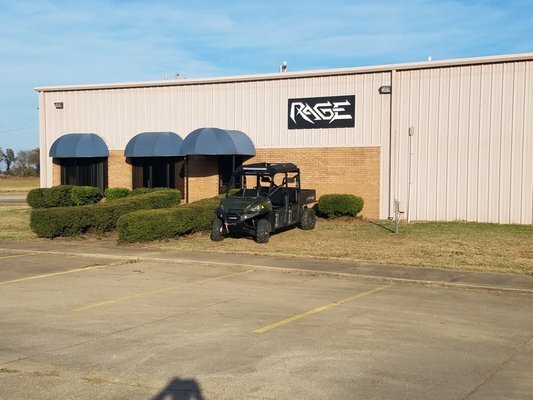 Rage Fab only uses the best material, the best welding equipment, and CNC cutting equipment and powder coating equipment. Thanks so much for visiting our online store. Our team is excited to provide you with an impeccable online shopping experience and remains available to assist at any time. If you have questions, comments or concerns about your order or the content found within this website, please feel free to contact us via telephone or email and one of our experienced team members will get back to you right away. Again, thanks for visiting our store and we look forward to serving you!